Robbie Williams has been added to the bill for the Queen's Diamond Jubilee Concert, organised by his Take That bandmate Gary Barlow. 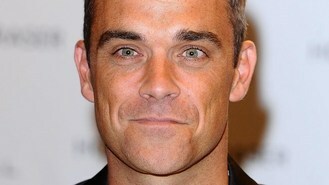 Robbie joins figures such as Sir Tom Jones, Sir Elton John, Ed Sheeran, JLS and Jessie J for the show, which takes place in front of Buckingham Palace. The Let Me Entertain You singer joked: "If this doesn't get me a knighthood, nothing will. I can't wait for the show." The show is being attended by the Queen as well as the Duke of Edinburgh and other members of the Royal Family. Gary said: "The Diamond Jubilee concert will celebrate the 60 years of the Queen's reign with an amazing line-up of world-class artists coming together to play at one of the biggest and most exciting live music shows in recent years." The stage will stand at the Queen Victoria Memorial which stands directly in front of the Palace and the concert will be broadcast on BBC One and on Radio 2. Justin Bieber has admitted he would love to duet with girlfriend Selena Gomez. Matt Lucas has joked that his debut as director could be "his first and last". Rufus and Martha Wainwright closed Sundance London with an intimate performance. Kevin Richardson is to rejoin the Backstreet Boys for a new album. Lady Gaga made her usual extraordinary entrance as she arrived in Hong Kong for her Born This Way Ball world tour. Tulisa Contostavlos was supported by her new man as she made one of her first solo performances since leaving N-Dubz. Alicia Keys would be Katy B's dream duet, the singer has revealed. Scottish singer and music producer Calvin Harris has claimed this week's highest new entry in the singles charts, rocketing into the number two slot with Let's Go. The Voice coach Will.i.am believes winning the show is not crucial for his contestants - because they will each find music success anyway.